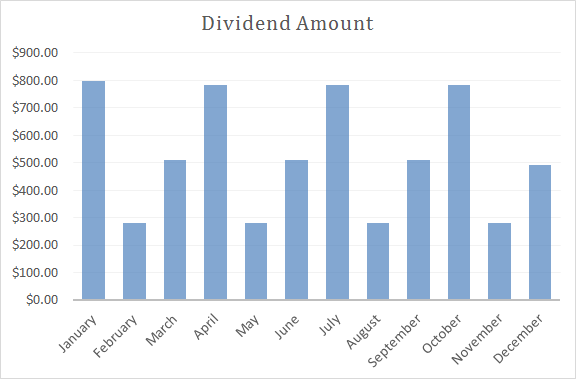 This marks a record month for dividends received. 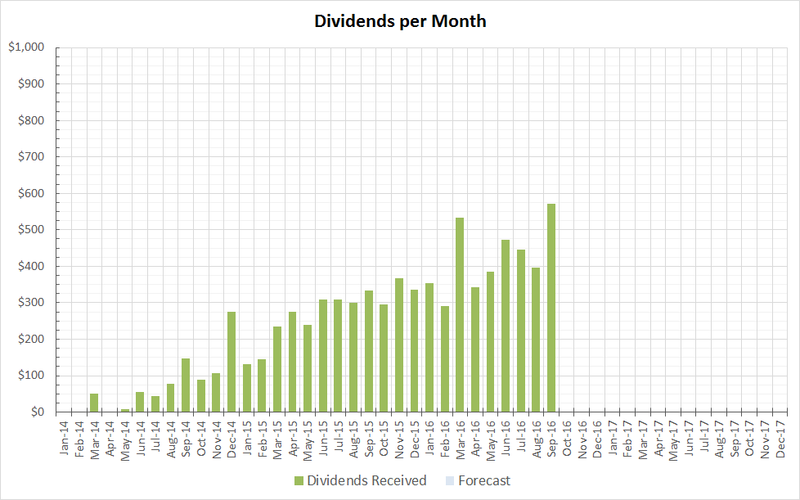 My dividends continue to grow by themselves at an average of 9-10% year over year. A large part of the growth is from my periodic contributions. In the future when my portfolio size and dividends are very large, my dividends will start to be more influenced by the company's' dividend increases instead of my periodic contributions. Since I have re-balanced my portfolio in the last 2 weeks, my dividend payments will start to become more erratic since I started becoming more heavily weighted in particular dividend paying months. The chart below shows what I expect to receive in the coming 12 months assuming no more contributions or dividend increases. Jan/April/July/October is very heavy because of my holding in Altria (MO). Mar/Jun/Sept/Dec are the second highest because those months tend to have a large number of dividend companies paying their dividends. Feb/May/Aug/Nov is light because I don't have large weightings in the companies that pay in those months. Congrats on the record high. I like the continued growth in your portfolio. A lot of good companies in your portfolio will be giving you increases for years to come. Great month. Keep up the good work! Congrats on achieving a record month of passive income. You received a pretty serious total for the month and that graph really paints a nice trend. Thanks for sharing. Awesome job YD! A record month and some great dividend payers. Love that BDX position and hope to build mine up but I never seem to have cash when it's trading at a decent value.